School's out, summer's here, and the kids seem like they're home way too often. The ultimate challenge is to keep them entertained and wear them out for a restful night. The good news is that when the sun shines, there are tons of awesome outdoor pools, bounce houses, swings, slides, trampolines (see our reviews of the best kids trampolines), and toys to keep the kids occupied while the parents take a sanity break. To find the best summer outdoor kids toys for 2019, we hit all the big toy stores - Toys R Us, Buy Buy Baby, and the big (and typically less expensive) online retailers like Amazon. We sought out the best-rated and most popular items. We did hands-on tests in the stores, got the manufacturers to ship us a few samples, and bought a few others to round out our tests. We tested over 25 products in our yard with 6 energetic kids ranging from 6 months to 10 years. Be sure to break out the kids mosquito repellent and sunscreens for the kids (hats are great, too! ), because they'll be out playing on these toys for hours! Some of the products broke after a few weeks, some got kinda funky and attracted bugs, and some others became a little dangerous with some splintering plastic in the hot sun. At the end of our tests, about a dozen products really stood out. These are listed below with some descriptions. The kids really loved these things, and they seem to be lasting the test of time and abuse by rowdy kids. From kids slides to kiddie pools, we've got your summer covered. Also check out our reviews of toddler and big kid bicycles for summer fun. Enjoy! Part I: The Best Water and Sand Tables of 2019! 1. The Step2 Spill and Splash Seaway Water Table. We had so much fun with this clever water table that features two water reservoirs, a waterfall feature, an umbrella, and tons of fun toys like a dolphin diving board and fish net! We stuck a slowly-running hose in the top pool and let it fill up while the kids played. After a few minutes, it became a fun waterfall for the kids to scoop and redirect water! One of the best features here is the decent-sized umbrella to shield your kids from the hot sun, though we do note that it doesn't quite shade the entire table. It includes some squirt sealife toys, and little characters. Oh, and the fish catapult is awesome, and speaking of catapults we found the table sturdy and difficult to tip. This is important because it's inevitable that you'll have a toddler sitting in this thing within a few minutes. The upper pool holds about 2 gallons of water, and the lower pool is quite a bit larger, holding over 3 gallons. We found it for about $70 online, which seems like a reasonable price for this versatile toy. A couple things worth mentioning. First, there isn't a drain plug so you have to tip the water out when playtime is over; it's lightweight (like 15 pounds) so not a huge deal. Plus those plugs always end up being pulled out during play, and lost around the yard (or in the dog's mouth). It's made in the USA, and is ideal for kids from about 2 to 4 years old. This is a great toddler summer activity water table, and you'll get many years of fun out of it! 2. The Step2 Water Wheel Activity Play Table. This is basically a simpler version of or #1 water table. Fill this up with some water and your kids will be having fun for hours with a funnel water tower that spins a wheel, sailboats, and a dump and fill container. The little kids in our group loved playing with this one because they could stay standing in the yard while cooling their hands and arms in the water. Parents loved it because it's fast and easy to fill (doesn't take way too much water), and super easy to tip and dump out when the kids are done playing (and so the birds don't use it as a bath in the morning). The 15 month old in our group loved to climb up and sit in it, which seemed like a ton of fun. 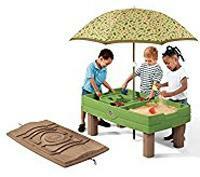 Also, parents mentioned that they have used it also as a sand table indoors or outdoors when the weather cools down in the fall - which makes this a super versatile toy for under 50 bucks. It was very easy to assemble and clean. Cons? Well, we think it would be better if it had a little cover, and maybe some little toys that were a bit more substantial. Overall, a great summer (and beyond!) toy that will last your kids a good amount of time. 3. 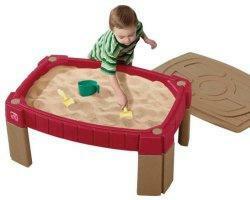 The Step2 Naturally Playful Sand Table. 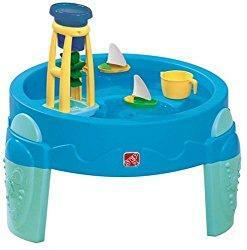 Just like the water table, but quite a bit bigger, this can double as either a sand table or water table. It's bigger than the water table, holds more sand, comes with some fun toys, and also includes an awesome cover to keep the dirt/leaves/bugs out. The kids in our group loved playing with this. In our tests, we first filled it with dried beans and used it indoors, then we filled it with rice and used it on our deck, and then with sand in our yard. All super fun, and the kids loved having all the play right at their level. Parents loved being able to cover it up to keep the kids out of it when they wanted, and also to keep it clean. Speaking of that cover, though: it's not quite waterproof because there are holes in the corners to tie it on, and water can leak into them during the rain. Wasn't so bad, but definitely worth mentioning. If you're handy, you can fill those little holes with some silicone caulk and solve the problem. Note that this doesn't include the sand. We recommend silica-free sand, which runs about $5 per bag at large home improvement stores. Also note that we did indeed empty out all the sand and make sure it holds water for use as a water table. It does, and it's huge and awesome! 4. The Step2 Naturally Playful Sand & Water Center. This is a unique combination water and sand table. Half of the table is for sand, and the other is for water. It also has an awesome umbrella to block some of the hot summer sun, and a fitted cover to keep the bugs and dirt out when it's not being used. In our tests, kids seemed to love having the flexibility to play together while doing somewhat independent things: one playing with the sand, and the other with the water. It also includes some cute accessories that make it even more fun, including a little shovel, two little buckets, and some little boats. The styling is a nice natural look as well, nothing too colorful and kid-centric. Cons? Well, we initially thought that this was the golden ticket - how could you go wrong with both a water and sand table in one!? Well, after about an hour of kids playing in it, it looked pretty disgusting. Kids were basically washing their hands in the water after playing in the sand, and of course some boys were making mud by mixing the two. Not what we expected, and definitely a potential down-fall. Part II: The Best Kiddie Pools of 2019! 1. The Step2 Play and Shade Pool. This is a little like the water table in that it includes some cool water funneling toys, but it sits directly on the ground and is intended for pretty small kiddos. Even though one of the 4 year old boys in our group loved it, he looked a little ridiculous in it. He fit in it, and a 15 month old jumped in with him, but they really took up all the space. This is basically a mini kiddie pool (about 3 feet diameter) that is pretty good quality and will last for several summers. 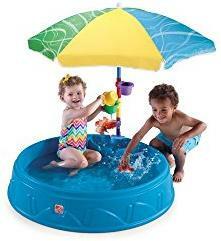 As you know, we think a lot about sun exposure and safety (see our reviews of the best kids sunscreens of the year here), and we really love this kiddie pool because it includes an awesome 40" diameter umbrella that actually does a decent job of blocking some of the sun. It's height adjustable, so that helps. That means more time in the pool without having to worry, and also something to attach the cool water play toys to. Cons? Well, the pool has no drain which can be a pain since you have to bend down to flip it over and drain. But in reality, drains don't quite do the trick when the pool sits on the lawn, so we prefer the tip-over method. Overall, this is a cute little option that will keep the little ones busy for hours! 2. Intex Rainbow Ring Inflatable Play Center. This is an amazing pool for the price. 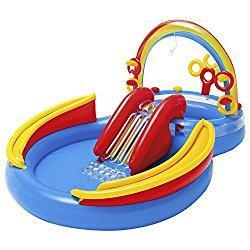 With basically two kiddie pools in one, a water slide between them, an overhead sprinkler, ring toss, and ball ramps, this is a feature-rich kiddie pool for only about 50 bucks. While the Step2 Play and Shade Pool is basically suitable for kids up to 2-3 years old, this one is best for kids up to about 4-5 years old. When we tested it in our yard, even the 7 year old girl in the group was loving it, bombing head-first down the slide like she was at a water park. It's much bigger than the Step2, coming in at about 10 feet long and 6 feet wide. Long enough for an adult to join a kid or two in the larger part of the pool. The kids absolutely loved the water sprayer attachment: hook up your water hose to a little attachment on the side and you've got an awesome sprinkler spraying down on the kids and keeping the slide nice and wet. Cons? Well, the inflatable rubber/PVC could be better quality to prevent eventual leaks, and it would be great if it had a drain plug. Overall, this is a large and awesome kiddie pool - bring the friends! Note that Intex also makes a Mermaid Kingdom version, and an awesome Dinoland version as well. Click the links to check them out! 3. 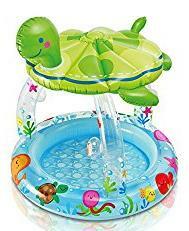 Intex Sea Turtle Shade Inflatable Baby Pool. 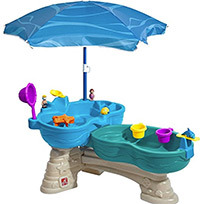 This is small like the Step2 pool, but includes an awesome turtle up top to shade your baby from the hot summer sun. This is good up until about 2 years old given the size and simplicity. No frills here, but certainly a lot of fun. Just simple fun, easier filling and cleaning up, decent protection from the sun, and a nice small footprint. Not to mention it's adorable. When we tested this in our back yard, everyone thought this was the cutest option among the kiddie pools. We agree! The one pictured to the left is the sea turtle version, which tends to run low on stock, but note that Intex also makes a Royal Castle version, and a Cute Mushroom version as well. Check them all out because they tend to have different prices at various times, and you might be able to get one version for as cheap as about $15. 1. Blast Zone Magic Castle Inflatable Bouncer. If your kids like jumping like ours, you know they'll love an awesome bouncy house for their own yard! 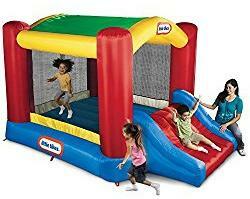 Last year we rented one of these for a birthday party and ended up spending about $100. If only we'd known that you can get an awesome one, that is much cleaner, for the cost of less than 3 rentals. This bouncy house is about 8 feet wide by 8 feet wide, with a 3 foot slide coming off the front. Holds up to 3 kids, or combined weight of 300 pounds. We unpacked it and were worried it would take forever to inflate, but really only took about 2-3 minutes with the included blower. This was fun for hours. At one point we had 4 kids in it having a blast, even though the manufacturer says a limit of 3 kids at once. We used it with and without balls, and I think the big kids prefered without the balls because they could bounce higher without stepping on a ball and hurting their ankle. The cool thing about this bouncy house is when the kids are done bouncing, you open the valve and it deflates and rolls into something the size of a large rolled up sleeping bag. Right now, we have it stored in a rubbermaid container in our garage, and we plan on inflating it again this weekend. We don't recommend leaving it inflated in the yard, or it will get pretty gross pretty quickly. Only takes about 5-10 minutes to deflate and pack away. Awesome fun at a really reasonable price. This particular one is the best we can find. It's tough, easy to use, and super fun and safe with the screened in sides. 2. 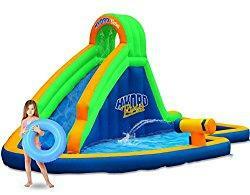 Blast Zone Hydro Rush Inflatable Water Park. It's not really a bounce house, but it is giant and inflatable, and definitely just as fun. It's also quite expensive, coming in at around $480, but it is also certainly the most substantial one on the list. This is basically like having a miniature water park in your own backyard, with a huge and awesome inflatable water slide, kiddie pool at the bottom, and a large water cannon you can hook up to your garden hose. This thing has it all. Hook up your garden hose and it will get the water cannon spraying as well as a top sprinkler to keep the slide wet and running smoothly. When we filled it up, we simply hooked up the hose and let it do its trick for about an hour. This was an awesome way to do it because it filled somewhat slowly which helped warm the water in the sun as it streamed down the slide. It is quite big and has a capacity of 6 kids, ages 3 and up. The steps to get up to the top of the slide have little holes to stick feet in as well as cloth hand-holds to pull yourself up. Surprisingly sturdy and well-built, and the slide has good sized walls on it to keep kids safe and going in the right direction. And it inflates in about 2 minutes, and deflates and rolls up in about 5 minutes. Our kids absolutely loved this thing, and they beg for us to take it out and inflate it on every warm summer day! 3. Little Tykes Shady Jump and Slide Bouncer. 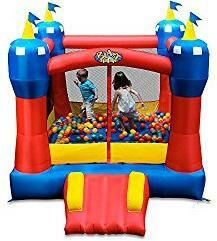 Here is another awesome bouncy-house option, coming in at around the same price as the Blast Zone. It is a bit smaller than the Blast Zone bounce house, coming in at 7' wide (the Blast Zone is 8' wide), but definitely just as much fun. It also has a big advantage with the huge overhead canopy that blocks the sun and keeps it shady inside. Maximum combined limit for up to 3 kids is 250 pounds (the Blast Zone one is 300 pounds). One of the dads in the group had a lot of fun in this one, and said it seemed really well built and puncture-resistant. But he was hitting his head on the canopy the entire time (he's 6'2", so not surprising). Out of the package, it was easy to roll out and inflate using the included blower (which stays running during use, just like any larger bounce house). Just like the Blast Zone it has a slide coming off the front, which makes it easier for the little ones to climb in and jump. When it comes down to it, we prefer the Blast Zone, but this is definitely a great second option for bouncy houses.